See that up there? That’s a beauty, that is. Chicken salad with dill on an everything bagel. 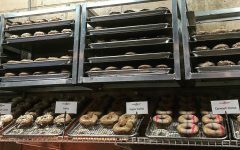 It’s pretty close to nirvana, and you can find it at Bagelworks on the Upper East Side in New York City. When I first moved to the city I ended up crashing on a soon-to-become very dear friend’s couch. I was doing that thing where you go on what feel like thousands of interviews, trying to save as much money as possible while still having a social life, all while trying to get your footing in the Big (bad) Apple. It’s a lot, it’s incredibly draining, and there are few things that seem to put a smile on your face. My saving grace was Bagelworks, which was conveniently located just around the corner from my friend’s apartment. Which means that this is where I started my morning just about everyday, usually going for the sausage, egg, and cheese on an everything bagel. I’d show you a photo but I’ve never taken one because I can never wait to start eating. This is the most perfect sandwich, balanced layers of deliciousness on a fresh, crispy chewy bagel. Bagelworks is a traditional, mom-and-pop Manhattan shop, and while it’s sort of rough around the edges, it’s up front and honest — everything happens on site, and if you’re there at the right time you can see them boiling the bagels and putting them in the oven, all by hand. It’s a lot of work, and you can taste it in the final product. My highest stamp of approval goes to this place, vouched for by the fact I moved 20 blocks away and still make the trek on foot for a weekend breakfast sandwich. If that’s not true love, I’m not sure what is.